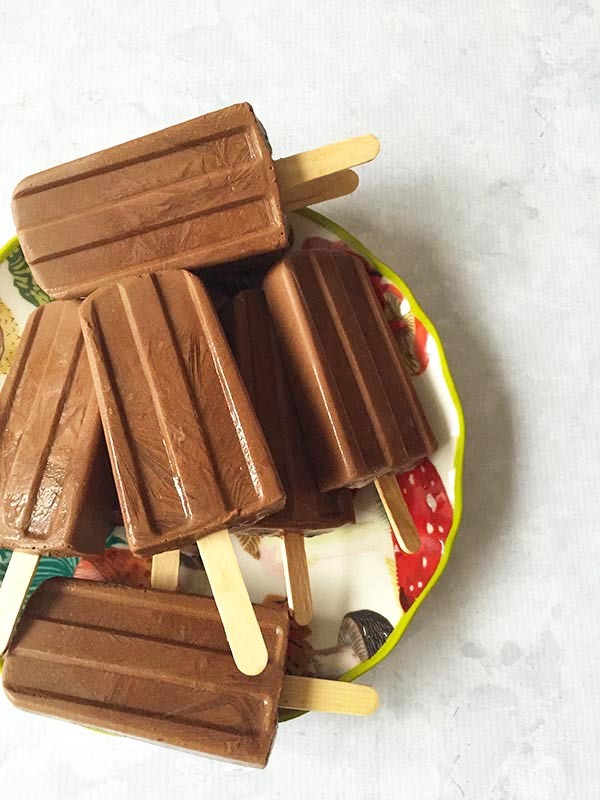 These Chocolate Coconut Cream Gluten-Free Fudgesicles are dangerous!! No joke! You can easily eat them all in 3-4 days – EASILY!! They are dairy-free, gluten-free, sugar-free (yup!! NO SUGAR! ), soy-free, grain-free, nut-free and even banana free. BOOM. Dark, decadent, creamy and fudgy. Sinfully delicious. Perfectly Paleo, Whole 30 approved, nut-free, yeast-free and even Candida friendly if you follow a plan that allows unsweetened chocolate. For some reason my Winter has been all about popsicles! My mind is in Summer, while I’m freezing over here in 20 degree Manhattan weather. But what I have come to recognize, is that while on elimination diets like Whole 30, Candida, Yeast and Sugar-Free it is easier to create popsicles over let’s say cake where you would need some form of sugar, natural or not. Not to say it cannot be done, because it totally can. But, on the mornings I wake up inspired to create something I can enjoy – guilt-free – I go straight to popsicle making. It’s kinda liberating when you can create something so delicious that is perfect for your exact needs. Most recently I discovered Culinary Coconut Milk at the Market. It comes in a box by So Delicious, usually found in the boxed non-dairy milk section. There is the full fat version, and the light version. I LOVE both. They can do what regular coconut milk can’t do – create the extra creamy factor. 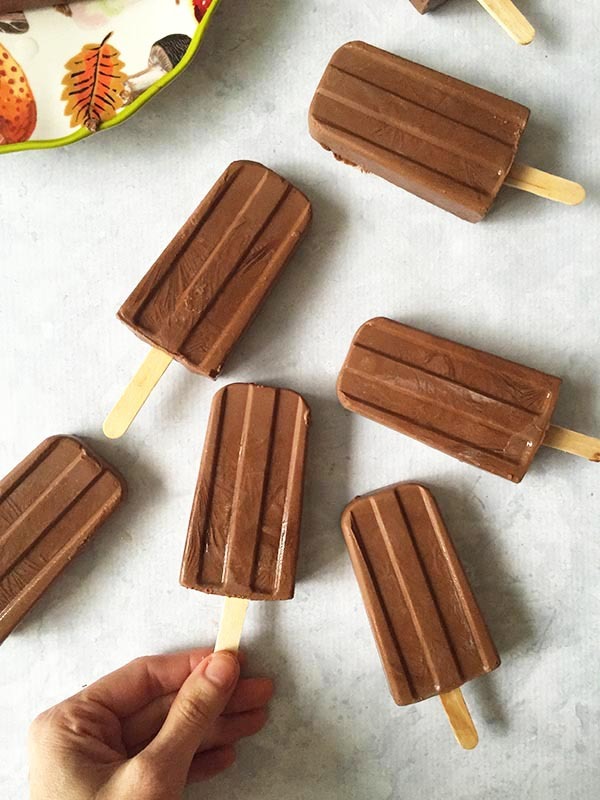 Now I have another chocolate popsicle recipe on my blog that is equally divine, but it doesn’t use coconut cream, it uses non-dairy milk which is much thinner and an avocado base. My other recipe which is also deeply decadent tastes more like a chocolate popsicle, then this recipe. THIS recipe tastes like a chocolate fudgesicle. Get it? In addition to the decadent deliciousness you are going to get out of this fudgesicle – here are some coconut benefits to be really happy about! Add all ingredients into a high speed blender like a Nutribullet or a Vitamix and blend well. Gently shake the popsicle mold on the counter to even out the mixture in each mold. Freeze for at least 6-8 hours. The longer the better. If you use a small avocado, you will want to use 1/2 avocado flesh. If you want to use a sweetener other then Stevia, then use 1-2 tablespoons of real maple syrup, but know that would not be candida diet friendly. If you feel that your mixture is too thick, add more water, but keep in mind it is meant to be creamy. If you do not have enough mixture for 10 popsicles, then add more water. My favorite brands of Liquid Stevia are Sweet Leaf, Nu Naturals Alcohol Free Stevia, and as a treat I love the NOW Chocolate Liquid Stevia. Gluten/Dairy/Nut/Sugar-Free Chocolate Coconut Creamy Fudgesicle goodness! DIY - EASY. If you use a small avocado, you will want to use ½ avocado flesh. If you want to use a sweetener other then Stevia, then use 1-2 tablespoons of real maple syrup, but know that would not be candida diet friendly. If you feel that your mixture is too thick, add more water, but keep in mind it is meant to be creamy. If you do not have enough mixture for 10 popsicles, then add more water. My favorite brands of Liquid Stevia are Sweet Leaf, Nu Naturals Alcohol Free Stevia, and as a treat I love the NOW Chocolate Liquid Stevia.